Well hello again! Didn’t I just see you yesterday? Yes I am posting again ya’ll and guess what? 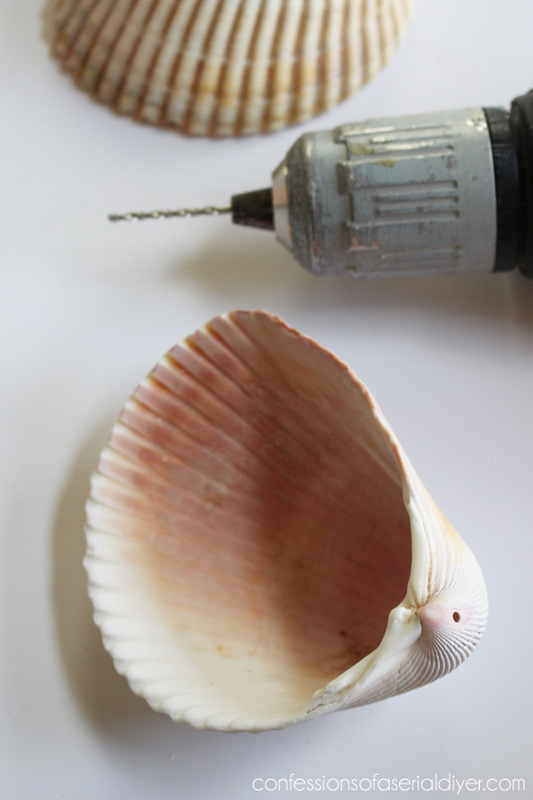 I broke out the shells again too! 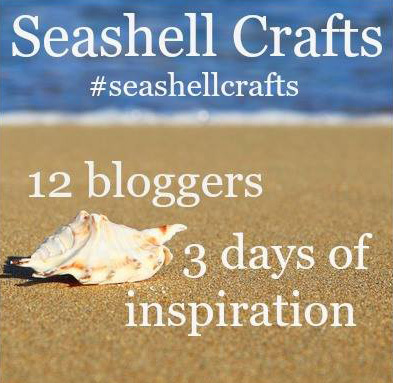 My friend Kathy from Petticoat Junktion had a great idea for us all to come up with a fun project using shells. 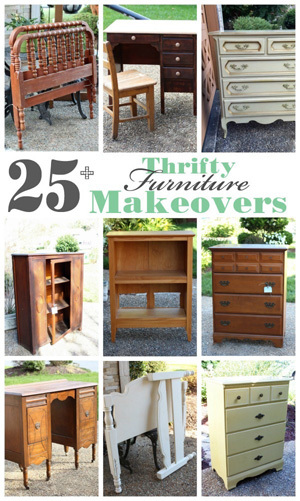 Now I just posted the perfect project for this challenge yesterday! 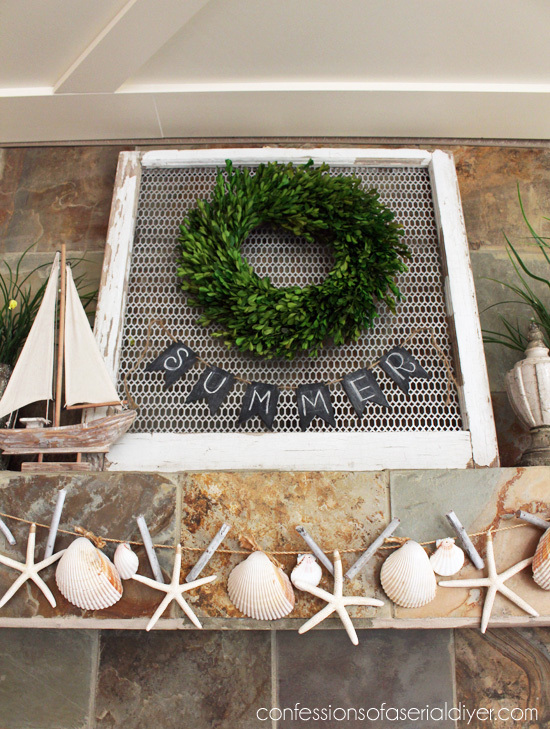 I shared this fun shell wreath inspired by Pottery Barn that just screams SUMMER! 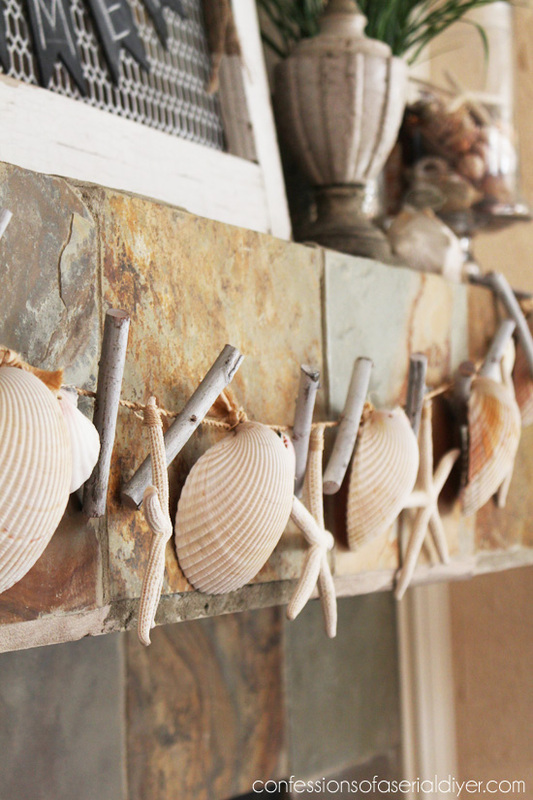 How about a shell garland to Summerify your mantel? 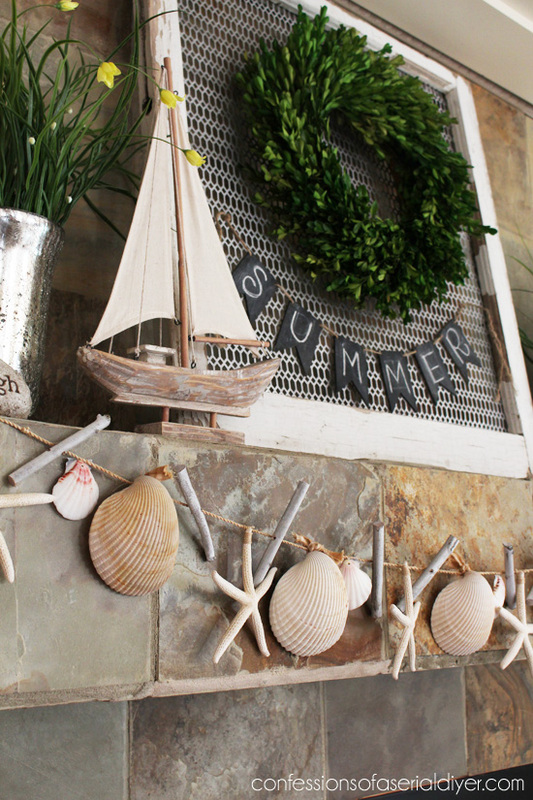 This is so fun on my mantel and adds an instant touch of Summer. 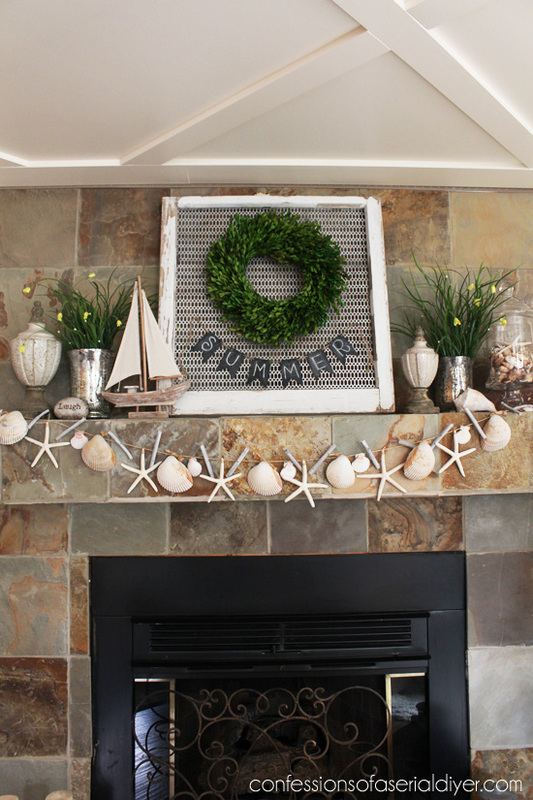 I swapped out a few items from my Spring mantel, but decided to keep the boxwood wreath and the other greenery. I like it mixed with the coastal elements. 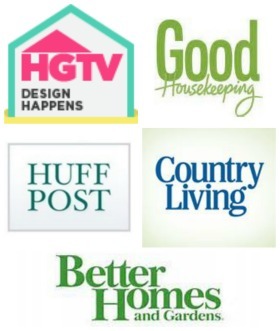 I’ve included a few affiliate links so you can find the products I used. I loved it at the time, but it never looked right no matter where I hung it. 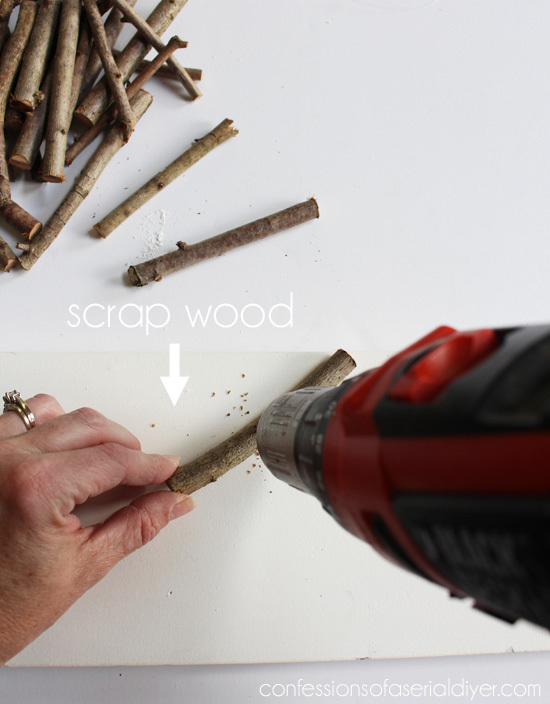 You can find one similar HERE or at Michaels. 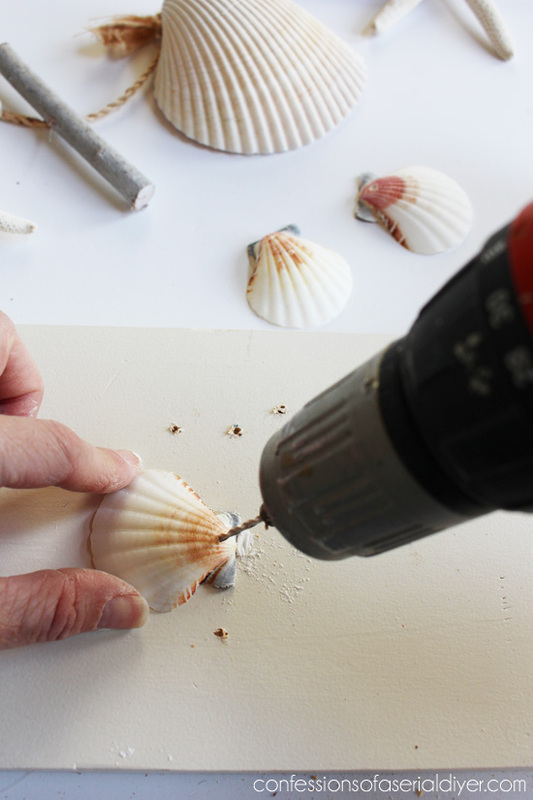 I started by drilling holes in the larger shells. 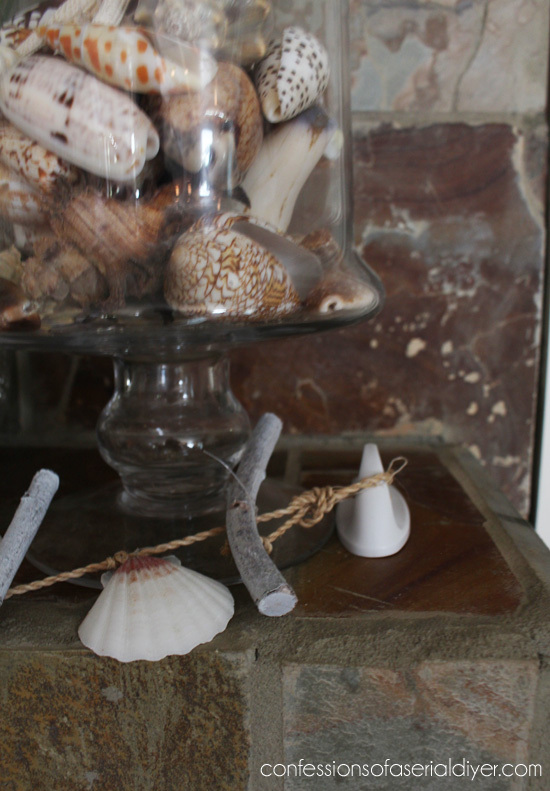 These were shells my oldest son had collected, but we just had them on display in a bowl on our table outside. Now we can see them all the time! 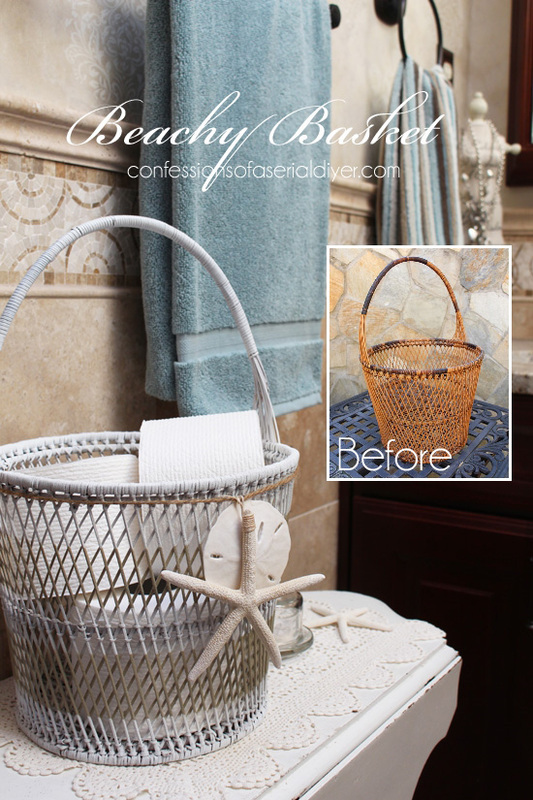 I white washed them next by spraying them with the primer and quickly wiping them with a dry rag. And added them here and there too. I added everything while the garland was laying on the table. 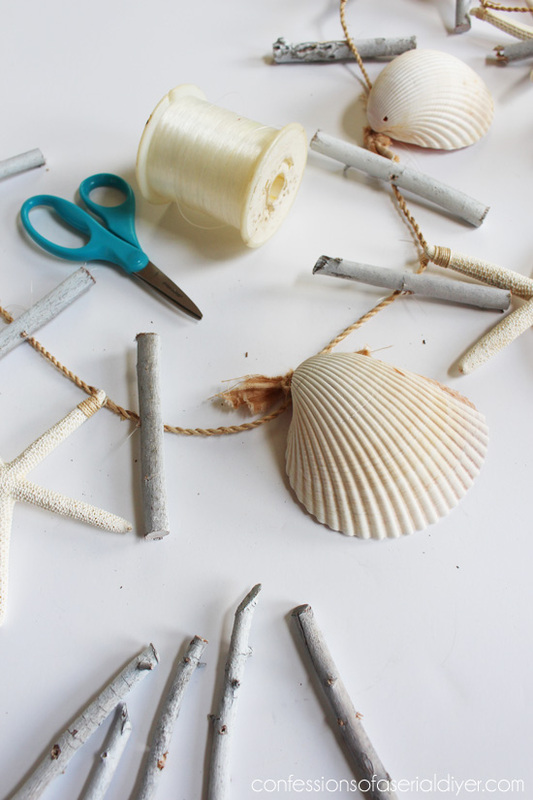 It might be a better idea to add all the elements while it is hanging to better see what you’re doing as you go. I am loving my new ceiling too! 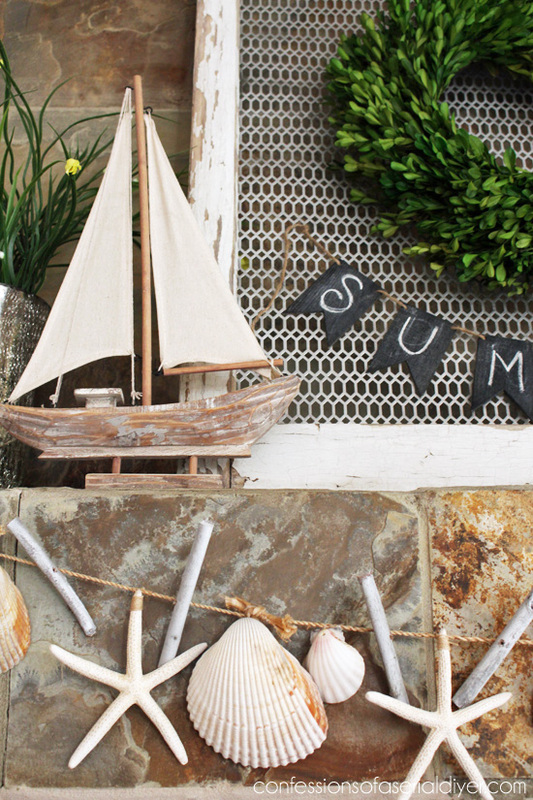 The little sail boat came from HomeGoods. I would have preferred driftwood instead of my neighbor’s sticks, but we don’t get much of that here on the east coast. 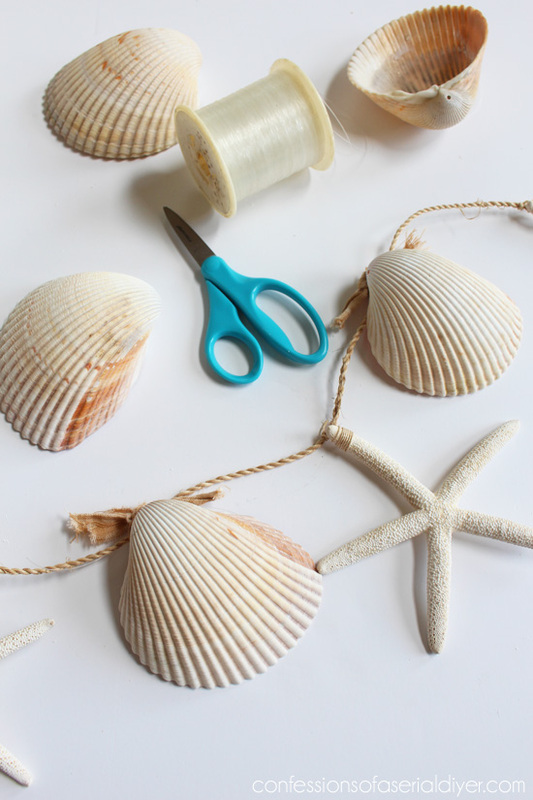 Want to see more fun ideas to spruce up your décor using shells? Check out what my friends are sharing below! 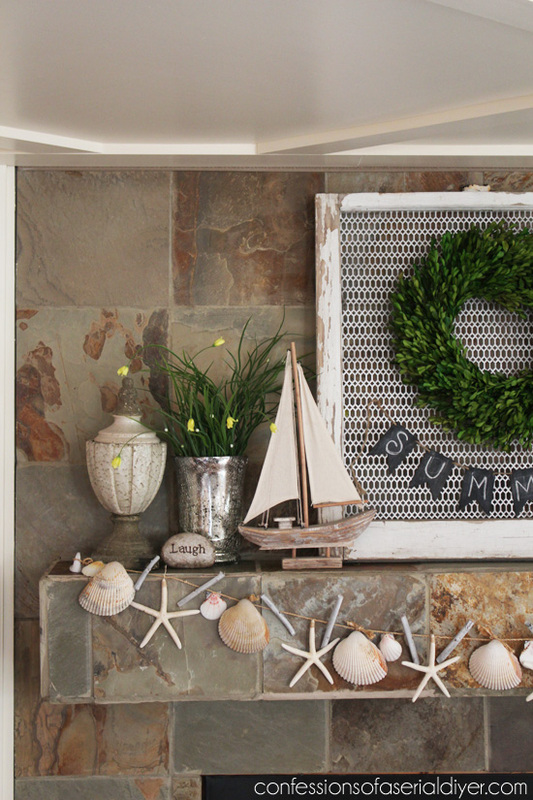 Oh my gosh, I am in love with your mantle! 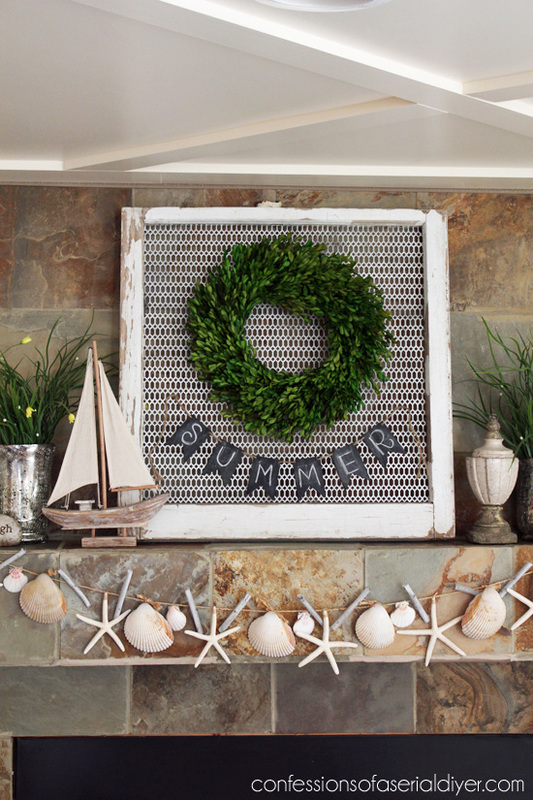 The garland, the sign… it’s gorgeous! 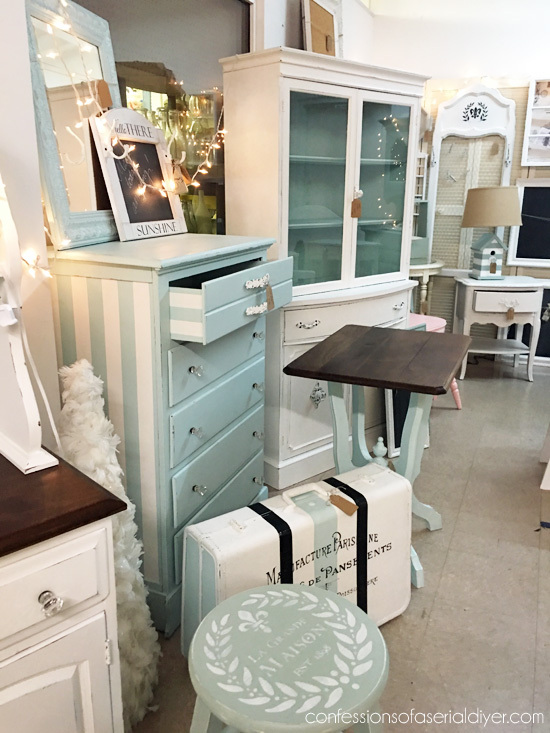 Love it Christy, you always have the greatest ideas! 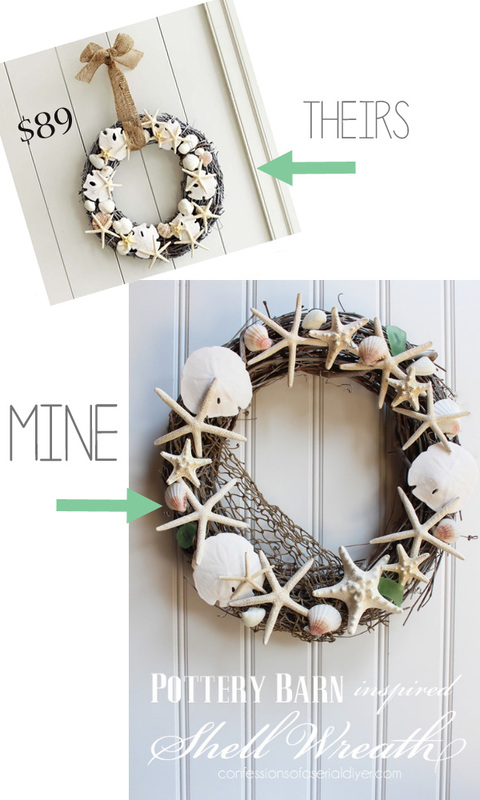 I’m going to share this and your coastal wreath with my sister who is currently decorating a guest room in a coastal theme. WOW….so beautiful! 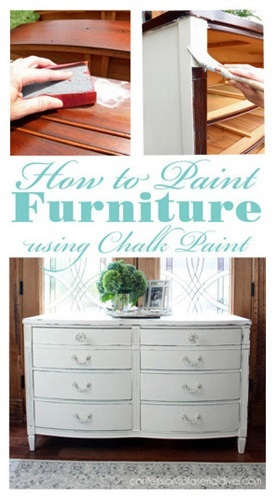 Great step by step tutorial too! Thanks for the tutorial Christy. 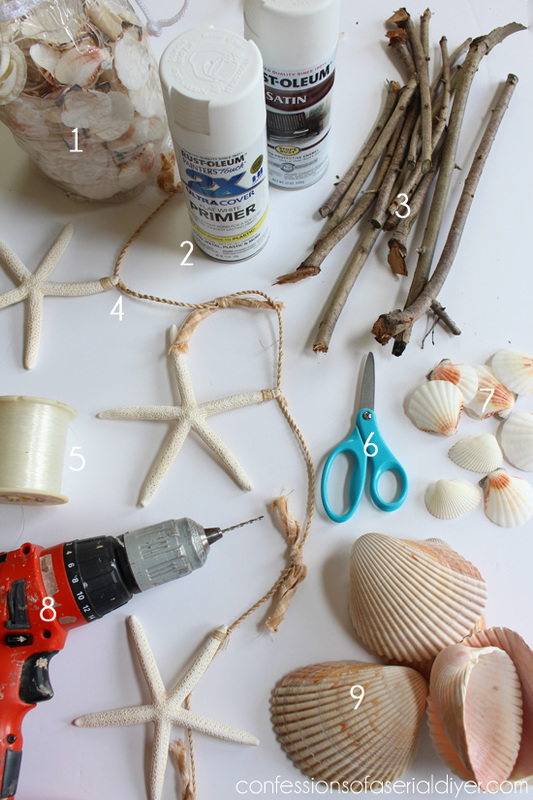 I was trying to figure out how to make a garland with my shells and never came up with a good plan. Now I know what to do. 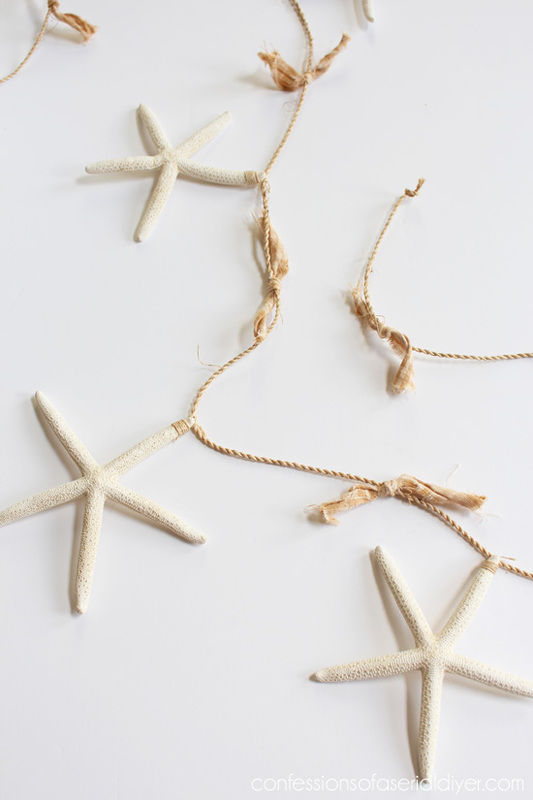 I have to get some starfish though. Thanks for sharing! I am IN LOVE with this so much. The entire thing is beautiful and the garland is only the icing on the cake! Oh Christy that is SO cute! 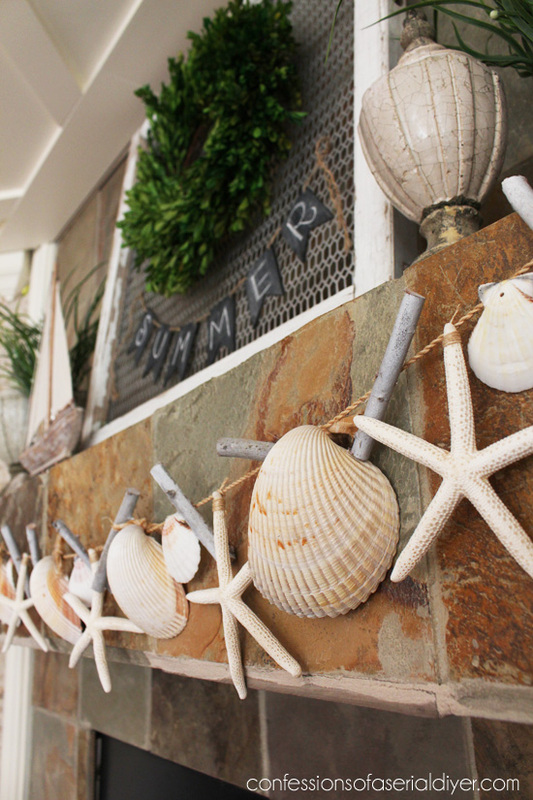 I love your mantel… you’re definitely ready for summer! 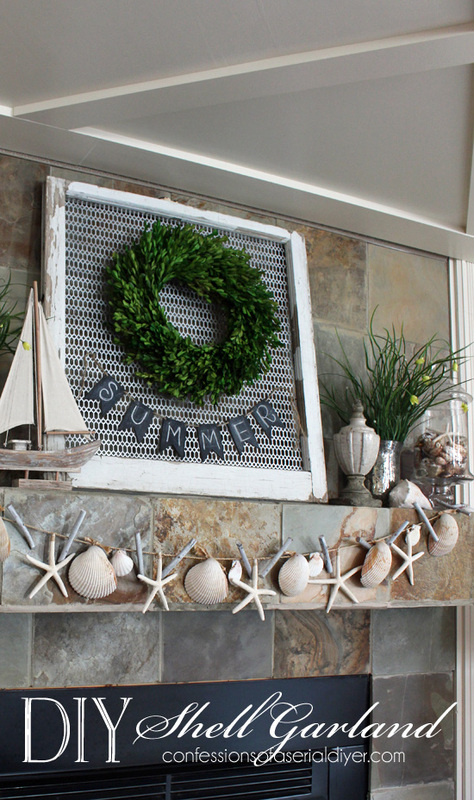 Christy, I am in love with your entire summer mantel! 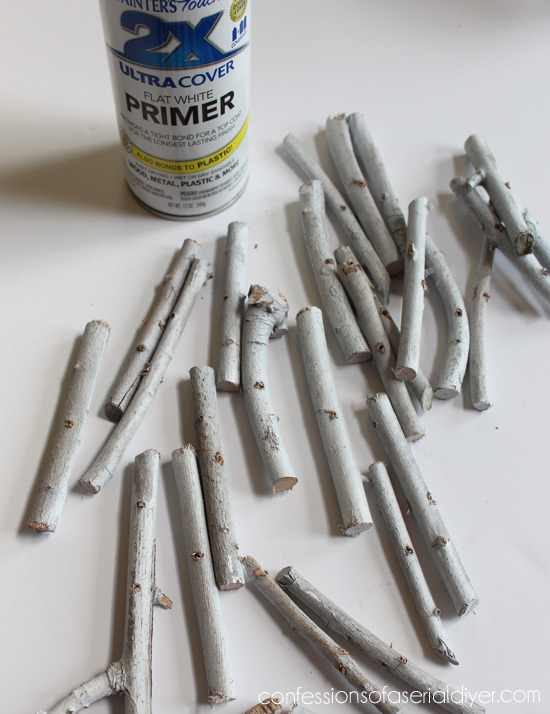 The garland looks fantastic against the slate, and I think it was very clever to whitewash the sticks! 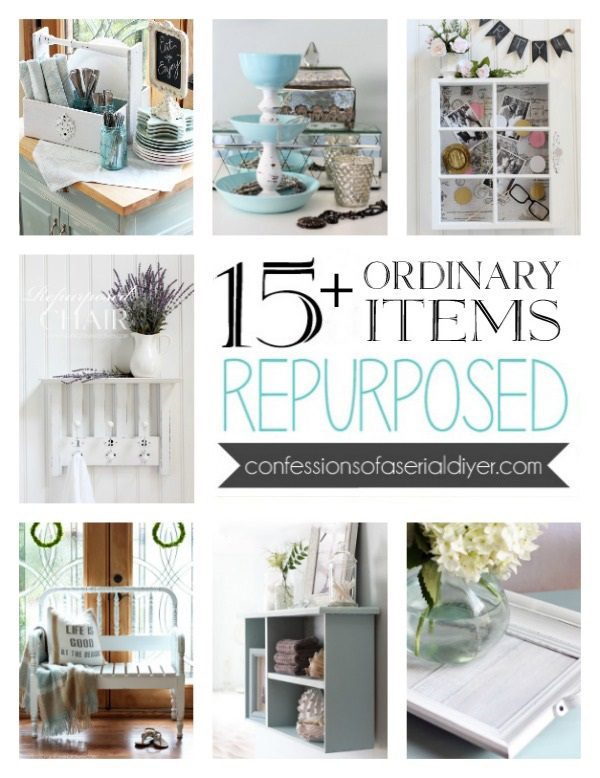 Pinning and sharing on FB! This is too cute! I had a garland like that too and pulled it apart. Hmmnn Now I think I’ll start putting it back together! LOL.. As always..you created a super project!! Thanks, Wendi! I loved that little garland when I bought it, but it never did look right no matter where I put it. I’m glad I was finally able to use it! This shows real exiterpse. Thanks for the answer.